Ultimately death: unstoppable we are! Oldschool? Legends? Yep! they are alive - Mefisto - 2.0.1.6: This Is the End of It All... the Beginning of Everything.... Thrash'core flows all of this track with their mighty shuttle! Binder thoughts guitar intro...and it takes the power of Deathrace! Before lyrical melodic piece, makes you wonder about lived through. You see the abyss? ready to pass? and if God forbid into the Void? Felt? Crawled? Saved? Act Dead - mid-tempo death your answer! Marsh negate and disgusted, but infirm and objective! That's it - Heads in the Sand! Melodic, emotional guitar intro and then viscous shift to dense march riffs of oldschool-death Frost of Inferno. Ballad, accompanied by a monologue - Hate Consumes Me. Banjo? Balalaika? THRASH - The Puzzle figure it yourself! But thrash is not always quick and pointless - occasionally is slow and thoughtful, 2.0.1.6. Clean vocals scratch your mind, melodical guitars helps him! Replentish sound from start even hard to understand - what they are?! 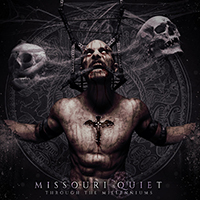 That's technical death band Missouri Quiet and their release - Missouri Quiet - Through The Millenniums . Next theme outcasts all, who doesn't believe in tech-death! Repressed they are! Next track In A Maze Of Time begins by intrusive death-core, which goes to the extent of all track. Something mysterious... and powerfull vocal blow! Reu Nu Pert Em Hru (part I: Reborn In The Sands) All of this are associated with broken rhythm and discontinuous parts - Reu Nu Pert Em Hru (part II: Winds Of War) and Reu Nu Pert Em Hru (part III: A New Manepher) (feat. Max Kovalenko of "Dysphoria"), sounds like brutal death it. Symphony, keyboards....from start of Continuum till the end of it! Mysterious keypad entry inspires extension? Noup!The Funeral Romance (part I-IV)) Death metal smash your ears with their powerfull blows! Harsh? mighty it sounds! Until musical box melody... and the same afterwards! Broken, intermittent rhythms, wonderful, amazing guitar parts - you'll bet! That's it - Nuclear Earth! You wanted some part of deathcore? Got it there - Falling Sickness (feat. Dan Watson of "Enterprise Earth")!